Did you know that your choice of lighting can determine how much Mercury you consume? Follow Target Solutions Limited! For all your Green Lighting Solutions, as you discover why LED lighting should be your ONLY choice! WHAT IS MERCURY AND WHERE CAN IT BE FOUND? Mercury is a chemical element that is found in the earth’s crust, it exist in different states. It has been useful in lighting in previous decades because it contributes to the level of efficiency and life expectancy of the bulb. When energy passes through two electrodes filled with low pressure mercury, the electron current excites the mercury vapor in the tube radiating energy. Energy allows for the phosphor coating on the inside of the tube to fluoresce, converting U.V light to visible light. Fluorescent bulbs which have been prevalent in the most recent years,contains a minimum of five milligrams of mercury PER BULB. Researchers have suggested the ocean contains at least 60,000 to 80,000 tons of mercury as an estimated 600 million fluorescent lamps are disposed of in the U.S. alone accounting for at least 30, 000 pounds of mercury waste. Mercury enters the waterways after it is dumped into landfills and broken. It leaches into the soil and eventually makes its way into a body of water. Bio magnification is positively linked to the food chain as aquatic microbes with the help of sulfides converts mercury to methylmercury. This later diffuses into the plankton that fish eat, resulting in its ability to make its way up the trophic levels of the food chain. 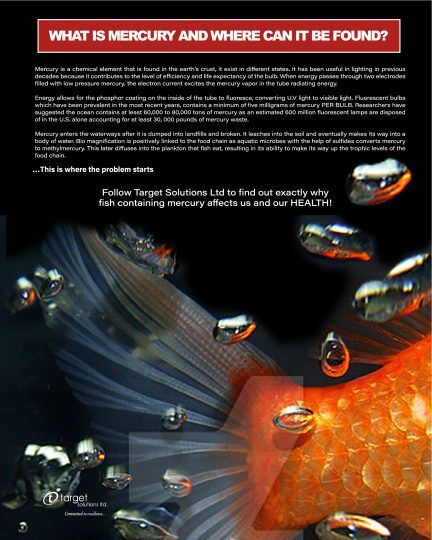 Follow Target Solutions Ltd to find out exactly why fish containing mercury affects us and our HEALTH!